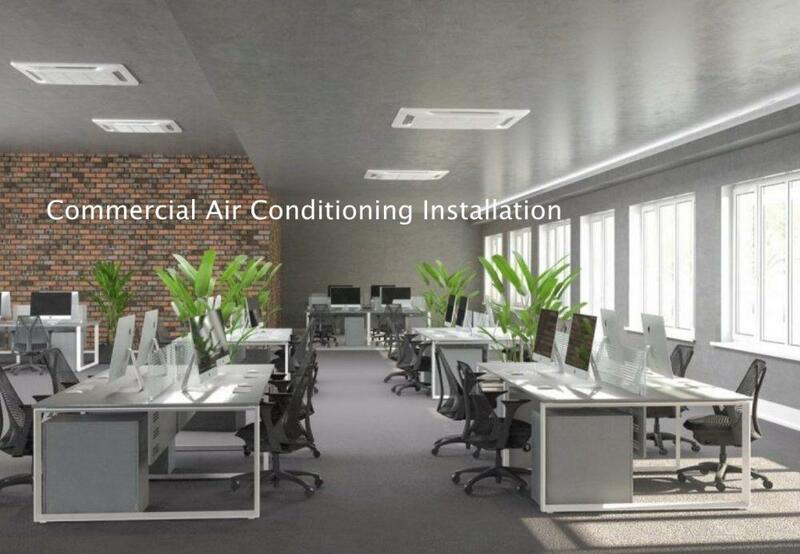 Whether an office or a retail setting, we can provide Commercial Air Conditioning Installation solutions from as little as £999. When it comes to commercial settings we can provide the widest choice of options. Indoor unit options range from: wall mounted, concealed ceiling, floor stands and more. The ideal indoor unit can, therefore, be selected and tailored to your individual Commercial Air Conditioning Installation room requirements. Experienced Air Conditioning Installation contractors will need to specify and size your AC systems. Commercial Air Conditioning indoor units can look the same as those used for residential premises. However, the performance is very different, based on increased static air pressure and internal coil sizes. The bigger internal fans and coils are required for commercial settings with high ceilings and greater numbers of occupants and machinery in a room. Do not consider trying to use cheap small bedroom designed units in retail and office environments. The cheaper price of the residential units will show in performance, with the limited pipe run lengths and ability to perform in low and high ambient temps. On the hottest months of the year when you need optimum performance, small bedroom Residential Air Conditioning units, will not handle the room heat loads of commercial settings. Commercial Air Conditioning, like most AC systems, boasts the option of being able to cool or heat. Furthermore, we can offer Air Conditioning that goes beyond that and can heat and cool in different rooms at the same time by a single outdoor system. Our Clients have the ability to have cooling in a boardroom meeting and heating to other staff areas of the building at the same time. This is a great option for office settings with different room temperatures. Men prefer cooler working environments, while women generally prefer warmer. It is normal practice to see AC systems running on both cooling and heating modes in the same working environment due to this. In Residential Air Conditioning environments, having bedrooms at night that can heat and cool at the same time has become the preferred choice with new ac installations. VRV (Variable Refrigerant Volumes) is typically the solution for large commercial settings. These large commercial systems are perfect heating and cooling solutions in large occupancy settings. To provide constant stable temperatures in commercial settings it is important to have controlled lows and highs. This is due to the demand scale during peak operational hours and closing time. During operational hours the system may need to run at 130%, whereas at closing hours it may need to perform at 20%. The ability to be able to have such a huge range in capacity allows performance and efficiency hand in hand. It’s like having a car able to reach speeds of 200mph but still, cruise at 30mph in its highest gear with no change in the ride. This is the power of the VRV system, capable of running one small 2.kw unit or twenty of them when all switched on at the same time. It’s no wonder VRV Systems have become the preferred choice of Commercial Air Conditioning Installation solutions globally. Commercial applications used for Residential Air Conditioning. When it comes to larger homes, VRV and VRF Air Conditioning systems are used. They provide better energy efficiency with a larger capacity on long pipe runs. This would be the case when the condensers may be tucked away at the bottom of a 100ft garden. When a number of these condensers are used in Residential Air Conditioning Installations they need additional acoustic housing. They perform within the majority of residential noise limitations, but at night will need additional acoustic dampening. Daikin – Air Conditioning and Refrigeration Systems in one! Daikin, ever the industry pioneer, have created a NEW commercial roof package system. It can do Air Conditioning and Refrigeration on the same system. Yes, you heard right!! Daikin’s “conveni pack” system also offers multiple circuits so in the event of a major component failure it can work off another circuit in place. Furthermore, this has never been possible before to run high and low temperature AC and refrigeration applications on the same AC condenser and system circuit. The energy efficiency, in lower bills from energy consumption and space requirements, is groundbreaking. The Daikin conveni pack is now the best choice of climate control systems for small to large food retailers. The store temperature and the refrigeration cabinets can all be serviced from one outdoor condenser. Food retailers normally have many refrigeration and separate commercial Air Conditioners on site. Furthermore, the smoother scroll type variable speed compressors in operation, resulting in fewer vibration leaks. This is a complete game changer also for residential homes with AC and Bespoke Wine Cellar Cooling systems. One system, one solution, better energy efficiency, less break downs!! Why Choose ECS for your Commercial Air Conditioning Installation? Because like with anything, YOU want the best product and service YOUR money can buy. As experienced Commercial Air Conditioning Contractors in London, here at ECS we also train our engineers in-house. Technical knowledge and time-based experience is key to delivering our customers results in a timely manner and keeping costs down. All our engineers are trained to high industry standards before completing our own in-house competence training and tests. As industry leaders, we have recently, through requests, started a YouTube channel. We deliver how-to guides on topics like, “how to give your Home AC unit a Minor Service“ and guides for engineers on how to perform technical tasks. This recent “How To” is a step by step guide on how to select and size magnetic contactors. In the video, we also show our engineer performing an Air Conditioning Repair. The engineer demonstrates changing the old contactors in a server room on a Uniflair close control system. These works where performed by our trained qualified staff. All of the works shown are real projects in our client’s setting. If you like the video please like and subscribe to our YouTube channel. After all sharing is caring!